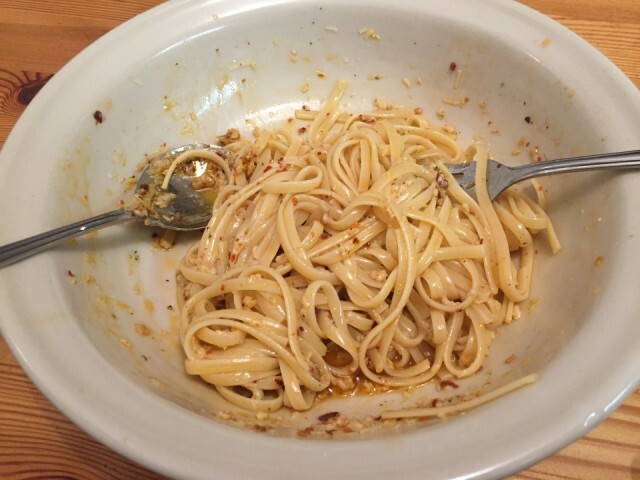 Been too long aglio, olio. Boil a large pan of water with a good few tsp of salt. The water should be quite salty. In a large frying pan, put the oil, garlic, and chili flakes. Heat slowly and gently for around 10mins. About the same time that the linguine is cooking. Be sure to not let the garlic overcook. It should be lightly golden but no darker. Just before the pasta is ready, add the rind from one lemon to the garlic pan and allow it to sizzle for a minute. Drain the linguine so as to retain a little cooking water on the pasta. Combine, both pans. Serve with grated parmesan and freshly ground black pepper. Top tip...garlic can often taste bitter and this is commonly due to the root starting to grown. remove any green or growing tips from the centre of your cloves.